“Take that word ‘homeless’ out, and use the word ‘Jewish.’ Would we be studying whether Jewish people could come down and ask for help, if they were in trouble?” asked the Toronto Disaster Relief Committee’s Beric German in May, when Council’s Executive Committee was fending off a request from Councillor Case Ootes [PDF] and certain business owners to ban panhandling in the city’s (undefined) “designated tourist areas.” German’s comment was initially strategically questionable, as it provided a considerable opportunity for the ban’s supporters to dismiss panhandlers’ defenders as dingbats. But the following afternoon, when a caller to AM640 suggested that homeless people should be strapped to treadmills and put to use generating electricity, we were reminded that German’s comment was depressingly apt. In a society in which the most vulnerable people are not only marginalized but demonized, groups like the Toronto Disaster Relief Committee are entirely necessary. Perhaps the best activist group in the city, the TDRC advocates for the dignity and survival of the people most at risk of becoming another name on a list. Staunch believers in better living through policy, campaigns such as the One Percent Solution (to restore government spending on housing to mid-1990s levels) emphasize that only the government is capable of meaningfully addressing the national emergencies of poverty and homelessness, and that resolving those problems–or at least making considerable progress towards ameliorating them–is very much doable and simply a question of priorities. In April, one of the group’s founders, street nurse Cathy Crowe, published Dying for a Home: Homeless Activists Speak Out, a collection of essays calling for an affordable housing strategy, written by some of the people who would benefit from such a thing. Giving a platform to those who need help but who otherwise have to fight to be heard is one of the noblest things one can do in our society, or in any society. Too often these debates exclude the very people around whom they centre, and it becomes too easy to relegate them to passive statistics. Every month, the TDRC holds a vigil at the Church of the Holy Trinity to remember those in Toronto who have died “as a direct result of homelessness” over the previous thirty days. The fact that this is a monthly ritual should be the first sign that something is very, very wrong with our city, with our province, and with our country, that we are not unable but rather unwilling to deal with the unnatural disaster in our midst. 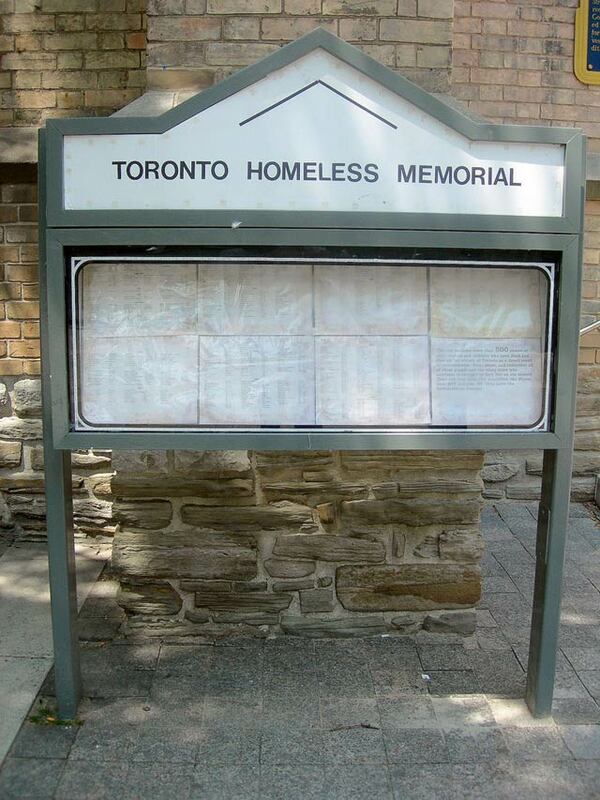 Photo of the Toronto Homeless Memorial in Trinity Square, maintained by the TDRC and the Church of the Holy Trinity, by photopia /HiMY SYeD.